Twin Spin is an innovative and unique video slot developed by Net Entertainment, incorporating a traditional old-school slot game with an exhilarating modern 5-reel slot game. Whether you are feeling nostalgic or wish to take a break from complicated video slots out there, you will immediately fall in love with this 5-reel slot with 3 rows and 243 Ways to Win. The bonus features presented in Twin Spin include stacked symbols, twin reels, and a top paying jackpot bonus worth 1,000 coins up for the taking. 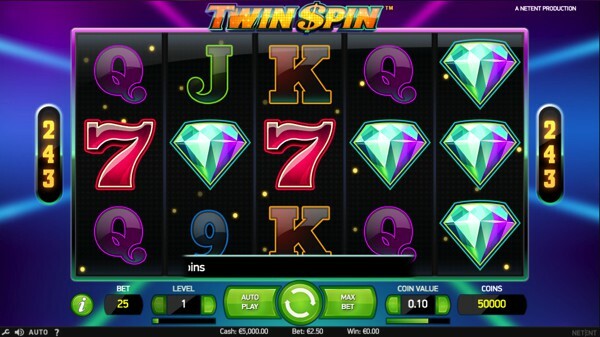 The Twin Spin theme incorporates a classic video slot style combined with a modern splash of space-infused graphics. The background consists of a dark blue hue and is highlighted in blue, green and magenta laser beams. There’s also flashing yellow stars surrounding the reels that blink at random while they coordinate into several racing lights that highlight winning combinations as electrifying sound effects play in the background. The reels are filled with vintage symbols that give the impression of a Vegas brick and mortar casino. The high valued symbols include a gigantic diamond, a red seven, a golden bell, a gold bar and some red cherries. The lower valued symbols include 9, 10, J, Q, K and Ace in bright neon colours. Twin Spin features 243 Ways to Win, so there are no standard pay lines to select. There is a total of 10 betting levels that increases by £0.25 for every level. This gives you the opportunity to bet a minimum of £0.25 per spin up to a maximum of £125.00 on a single spin. The labelled icon with the letters WILD represents the wild symbol in the Twin Spin slot game and will only make an appearance on reels 2, 3, 4 and 5. The wild symbol can also stand in for all other symbols on the reels to create more winning opportunities. The Twin Reel feature is probably the most unique and innovative feature in the Twin Spin slot game. Every spin starts with twin reels that are completely identical and positioned right next to each other. Once the reels are in motion, the twin reels can transform into three, four or five reels. Thus, increasing your chances of walking away with some decent cash. The symbols presented on the reels can also appear as stacked symbols with a maximum of three symbols each. Stacked symbols can also assist you in creating more winning possibilities while you continue to grab bigger pay outs. At first, you might find that the top paying jackpot bonus of 1,000 coins is a bit low. However, you will have the opportunity to claim up to 270,000 coins while enjoying this video slot from Net Entertainment. Twin Spin is a simplistic slot game with some rather sophisticated features including the 243 Ways to Win, twin reels, and stacked symbols. The slot volatility level ranges between medium and high variance which means you might have to spend some time on the reels, but once a winning combination is triggered, you’ll be smiling all the way to the bank thanks to the Return to Player also set at 96.60%. You can try a demo-version of Twin Spin below. The game can be found at Casinos that have games from Net Entertainment. We recommend BGO Casino and Videoslots Casino.